With 42-50″ screens fast becoming the norm here in America, why not separate yourself from the Jones with a FogScreen? 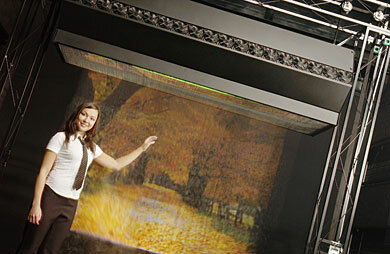 The FogScreen makes objects seem to appear and move in thin air — you can even walk through it! The best part about this system is that it works with all video projectors and since it uses a dry fog (although still made with ordinary water), you don’t have to worry about getting your room all wet. Apparently, you can also shot a different video image on each side of the screen. For more information check out FogScreen website. Girl not included.